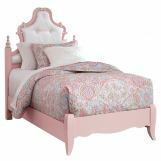 This dainty, feminine, Laddi bedroom collection features a replicated white paint finish, with replicated blush pink painted case tops. 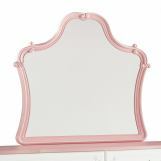 Laddi's cases feature a delicate recessed stretcher between front cabriole legs. 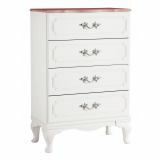 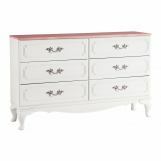 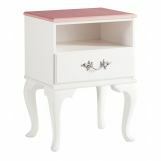 It has a French inspired detailed handles with a satin nickel finish and with embossed bead framing drawers. 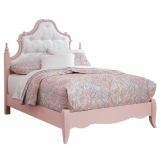 Laddi Collection's poster bed has button tufted, pearl finish upholstered panels, featuring scroll detailed crowns that has beautifully adorned post that supports a carved finial and a slim profile dual USB charger located on the back of the night stand tops.